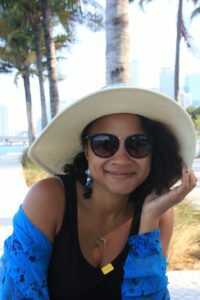 https://sheisfiercehq.com/shop/ buy now Ella Raphaelle Dufrene is a French-Haitian-American visual artist and art therapist currently residing in Miami, Florida. Ella discovered a passion for the arts while flourishing in the pursuit of dance. However, after a severe foot injury, Ella focused her attention toward the visual arts and went on to receive a BFA at the International University of Art & Design in June of 2010. In 2009, Ella began to create, organize and host her own exhibitions/events for emerging artists in Miami. Ella has been featured in various exhibitions during Art Basel, at Jakmel Art Gallery, Art Miami, Conception Art Fair and Arteamericas. Ella received her Master’s in Art Therapy from the Pratt Institute in 2015, and later began organizing wellness destination retreats in Colombia, which go by the name of Madre Tierra Retreats. Currently, Ella works as an art therapist in hospice, in a school for special needs children, as well as in her private practice, Lila Art Therapy Services, LLC. She also has experience working with people on the autism spectrum, drug/alcohol addiction, eating disorders, at-risk youth, as well as adults and children in both individual and group settings. Ella recently joined Guitars Over Guns with the intention to inspire and empower youth in Miami. She met Chad Bernstein in 2011 at a live music venue called PAX, where Chad purchased one of her paintings. She quickly fell in love with the organization’s vision and began donating her art for their fundraising auctions. Ella is now honored to serve as a mentor with the organization.